For too many years, we’ve been hearing “health food” claims for dark chocolate—without any support as to what intensity of cacao (dark chocolate can range from 50% to 100% cacao) how much chocolate, and oh, by the way, how the healthfulness is offset by all the sugar (the remaining percentage, that isn’t cacao, is largely sugar). Chocolate bars also include fat, but the fat is cocoa butter, a heart-healthy fat.(details). And what about that industry-insider knowledge that, using conventional roasting methods, most of the flavanols (the antioxidant compounds) are roasted out of the chocolate? There’s hope on the horizon for those who want to see chocolate as a healthy food—but it’s not going to be your basic Hershey bar. Barry Callebaut of Switzerland, world’s largest chocolate manufacturer, has received support from the European Food Safety Authority for its claim that cocoa flavanols, the antioxidant compounds that are found in cocoa powder and dark chocolate, can be good for blood circulation (more about antioxidants). 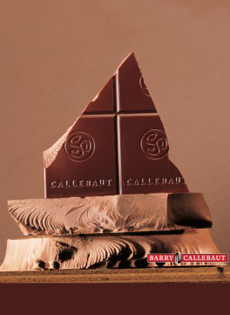 Barry Callebaut, the world’s largest chocolate producer, has pioneered high-flavanol chocolate. Photo courtesy Barry Callebaut. The chocolate tested was made with a special high flavanol cocoa produced by the company. If the health claim receives final approval from the European Commission later this year, European manufacturers that use high-flavanol cocoa may soon be able to make health claims on everything from candy to chocolate drinks, cereal bars and cookies. A final decision is expected at the beginning of next year. Since 2005, Barry Callebaut has conducted more than 20 clinical studies looking at effects of cocoa flavanols on people. The tests used cocoa powder and chocolate products made through a special process developed by the company. The process preserves up to 80% of the flavanols that normally would be destroyed in the conventional chocolate-making process. Flavanols have been shown to lower blood pressure, improve blood flow and reduce the risk of heart disease by stimulating production of nitric oxide, which relaxes vessels. Barry Callebaut submitted evidence from its studies, showing that the intake of 200 milligrams of cocoa flavanols a day contributes to normal blood flow. This amount can be consumed in 10 grams/.35 ounce of the specially-produced high-flavanol dark chocolate. The standard Hershey bar weights four times as much: 43grams/1.5 ounces.